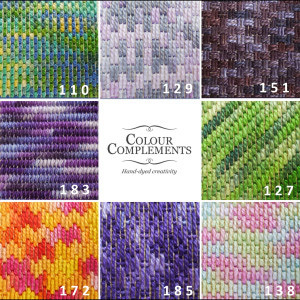 Lorraine is a National member and she has a beautiful website for her business Colour Complements. On her website, she shares inspiration for using her hand-dyed threads in a wide range of embroidery applications, from canvas work to wool applique, temari and beyond! Check out her blog, too! You may be familiar with Lorraine’s threads already - I was introduced to it in a kit for one of Carolyn Mitchell’s courses. She specializes in hand-dyed embroidery threads in a variety of fibres. Lorraine has always been fascinated with colour and colour combinations. She painted for many years and eventually ventured into textiles/quilting which led to an interest in dyeing fabric and experimenting with surface design techniques. In recent years she became interested in hand embroidery, specifically crazy quilting and canvas work. It seemed a natural progression to start dyeing her own threads. Lorraine opened Colour Complements in September of 2012. She dyes threads in her studio located on the Sunshine Coast outside of Vancouver, British Columbia. She is constantly “experimenting” with colours to create original and unusual colour variations. Mary Corbett of Needle ‘n’ Thread is holding a give-away of Lorraine's threads. Take a look and enter before Friday! Lorraine's threads look wonderful and would be a real joy to work with! I have entered the Mary Corbett giveaway and have my fingers crossed!